I am moving my speakers and need longer wire lengths. I am thinking of splicing the additional length needed. This will save me the trouble of rerouting the wires. Is it OK to use liquid solder at the connection. Will this degrade the sound. I posted a thread about this in the cable section. Use either solder or a good splice connect. I would also recommend some heat shrink to finish it, this will protect it from shorts and corrosion. Mingus, most experts in hi end audio will advise against splicing loudspeaker wire together due to possible increased impedance. Read the thread by poppachubby though. Good feedback. Could be argued but in all my years in this hobby, never heard it ever recommended. And, in all my years in this hobby, I've never heard any detrimental effects from a PROPERLY done splice. Oh, I agree with PC. I've never used "liquid solder" so I'd most likely recommend sticking to what he said. A big +1 ... a proper splice will not affect impedance and the shrink wrap mentioned by PC is a good measure of saftey thrown in. Isn't splicing exactly what you have to do with Magnepans that have captive wires? They assured me that there were no impedance issues with this. Fancy one part epoxy. Crappy stuff that doesn't work worth a damn for electrical applications. If you can't borrow a solder iron use a crimp on barrel splice (use the right tool, do not flatten the joint with a pair or ordinary pliers) or use a twist on wire nut. Do not use "liquid solder"! High quality silver solder, crimping or a twist on wire nut would all be preferable to using "liquid solder". BTW, what gauge of wire are you using and how much length are you going to add? Two important questions that havent been asked yet. However I AM IN THE "NO SOLDER crowd. Is more trouble and expense, but definately worth it. Go through the trouble now so you wont have to in the future. 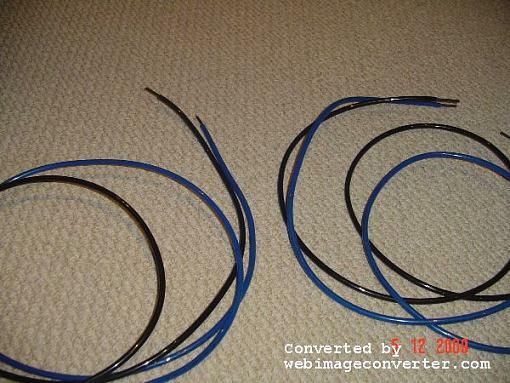 Besides, its an exelent chance to upgrade your speaker wires. As a Combat Engineer we had to not only be able to splice Det cord but electric systems as well. Our lives depended on correct splicing of electrical systems. The standard "Western Union" slice wrapped with electrical tape afterwards has never failed me. I'm still alive. Google it. Last week I was going to splice the wire as PC suggested but after thinking about it I decided to replace the speaker wires. Now the question is what speaker wires to use. I was at Home Depot over the weekend and saw racks of speaker wires. Are these adaquate or should I visit a store that specializes in audio/video equipment. Hoo boy, an invitation to cable wars! I use Cardas wire, made my own cables. Cardas has a multi strand Litz like wire in a number of gauges and Cardas sells good lugs for a little less than the high priced spread. I use Michael Percy as my supplier, honest prompt and an audiophile himself. Always happy to answer questions. He also handles wire from other suppliers, in my opinion they didn't perform as well as Cardas in head to head tests. http://www.percyaudio.com/ accepts PayPal with reasonable shipping charges. I've also used this Radio Shack for home theater, damn good for dirt cheap. If you really want to make a move, read up on solid core. Might be a nice time to research and find something different for yourself. Solid core can be had for quite cheap, Home Depot could probably supply you. Almost all solid core wire is an alloy containing steel to reduce stretch. Whether or not this is an issue is for each audiophile decide. Good suggestions. The thing with solid vs stranded wires, will I hear a difference. Depends on your system and your ears. Probably no difference on home theater receiver type systems. IMHO not recommended for high priced systems. The steel has magnetic domains, they have some hysteresis as they flip, this will add some broad band noise to tiny signals and might contribute to listener fatigue. This is my opinion, not everyone agrees. The survival of so many cable companies tells me there is something there. Audible ? Your mileage may vary. Just buy some wire from bluejeanscable.com Its Belden wire and inexpensive and sounds good. It comes in 10, 12 and 14 gauge. Its cheaper if you buy the unterminated wire and terminate them yourself with their easy to use banana's. Whats your budget? I would recommend that you read up on cable and speaker wire before you make a purchase. There is a wire for your budget, but you have to be happy with it. If you buy online, make sure you get the return policy before you buy just in case you dont like its sound. I did my research and decided to go with Analysis Plus interconnects and speaker wire...and I am happy I did. While bananas are inexpensive and convenient, the gold plating tends to come off after a few insertions. There's always a naysayer...Mingus, here's some info on solid core. BTW, it's copper NOT steel. Malcolm Omar Hawksford did the only comprehensive, scientific study on IC's in England. He published his findings in a paper called the Essex Echo. 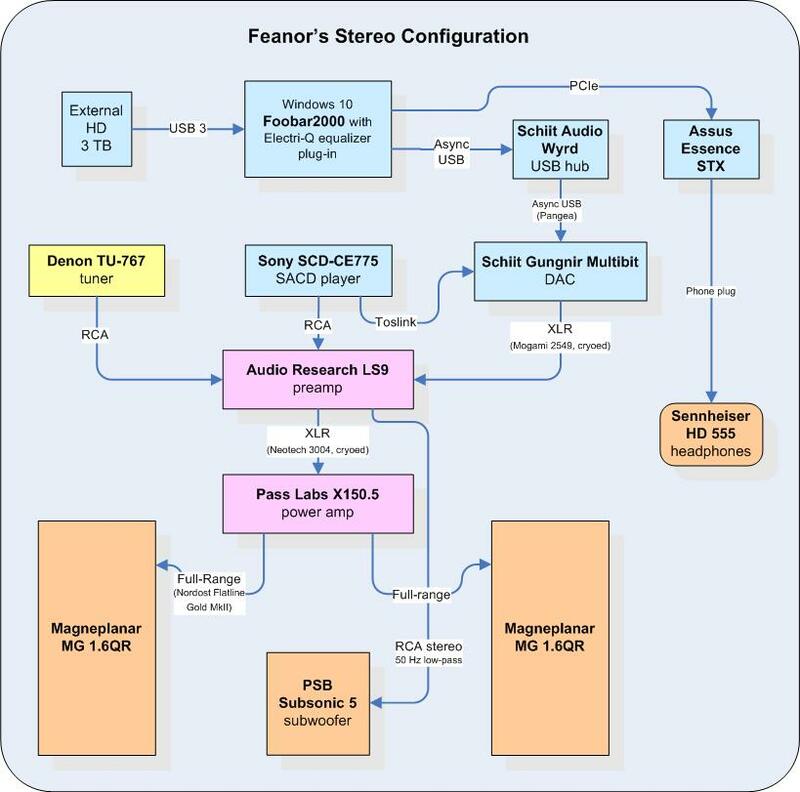 Stereophile has the article avaialble on their site but just in case they've done any editing, here's the link to Essex University in the UK. Some of it is a little heady, however I think his conclusions are pretty direct. He finds that versus stranded, copper solid core is the best carrier of an audio signal. Of course, it all comes down to your ears. I would agree with Herman on the H/T matter, probably not worth it but with a 2-channel system, for sure. The thing that manufacturers don't want you to know, is that solid core is at the very least, equal in quality to stranded. 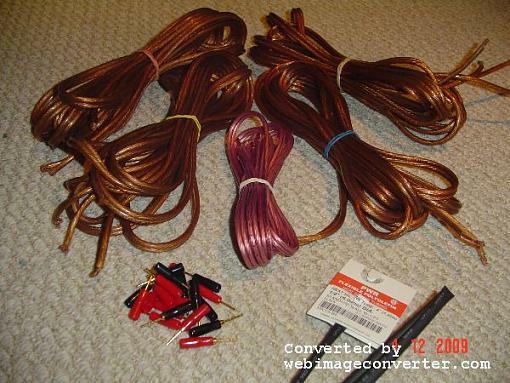 Copper solid core can be had for very cheap from most hardware stores. Mr. Hawksford suggests that a high gauge is best. Even better for the consumer! Anyhow Mingus, I don't want to sway you, I still use stranded and love the results. I also use solid core and love that too. I didn't say it was steel wire I said there was often a steel alloy in coper wire, the amount is tiny probably under 0.05%. Only you can decide if your source is free of alloys and whether or not any of this is audible. I have been an advocate that wires are important and for speakers low resistance is very important. I do agree that dollar for dollar solid wire is the lowest cost lowered resistance wire. There is a reason specialty wire(cable) companies advertise 4 or 5 nines copper (99.99% or 99.999%) and charge extra for it. Electrical circuits can be explained in a fairly simple way, but a true specialist will tell you the devil is in the details. Most systems and many listeners can not discern these things and the specialty wires certainly are not cheap, don't invest your hard earned money in them if you borrow some high priced cables and hear nothing different. Agreed. I think if the cables can be obtained for a reasonable price, one that competes with typical stranded models, why not?!? Whether or not the system can reveal the improvement is unimportant. The system will use the IC's to the greatest of it's ability. However, should an upgrade occur, the IC's will not only be ready, they will be greedily salivating at the sight of improved output. What I DON"T agree with, is the spending of a heap of cash for this non-result. In this case, spend to the capability of the output. Mingus, I was at Home Depot myself today. For $2.00/Metre, they had 22 gauge solid core, each strand was in a jacket and then the pair were in a nice tough casing. In Imperial this would work out to roughly $0.61/foot. Its purpose was probably for lighting, but I'm not sure. Essentially these are ready to go, you could add termination but I personally wouldn't. I bought 60 feet of 12 gauge today. No-name stranded stuff. Hooked up from an ad in the local newspaper. He was asking $25 CDN but I talked him down to $20. I'm going to use it for my H/T system which now has unterminated 16 gauge. This'll be the last upgrade to the H/T. He had them in 4 strands of 15 feet. OK Mingus, I made these solid core. Cheap and easy. Worth the time to try and see what you think. If you like them, you've hit easy street.